Have you seen the movie You’ve Got Mail? Have you yearned, as I have, to visit the children’s bookstore, The Shop Around the Corner, that is a central character in the movie? Have you wished, as I have, that it were real? Have you bemoaned its fate, being forced out of business by the giant Fox Books? If you’ve never listened to Nora Ephron’s voice-over commentary on the DVD, I urge you to do so. She believed so strongly in the need for books, and bookstores in children’s lives. In the 1980s, there was a wonderful children’s bookstore in my city, the Children’s Corner Bookstore. There weren’t such places when I was a child, but oh I loved this store, and a counterpart in the other major city in the province, the Bookworm’s Den. Unfortunately, these shops devoted to children’s literature disappeared years ago. Children’s bookstores and indeed, independent bookstores, are becoming a thing of the past, which is such a shame. Bookstores are so important in providing children with access to books. Of course, books are readily available online, but the experience isn’t the same. The purchaser tends to go directly to the title in mind. Browsing isn’t easy. In a brick and mortar store, there’s the experience of having a multitude of books to choose from, in a myriad of colors and sizes and topics. The books can be touched, dipped into, tested out. And there is always the chance of a serendipitous discovery of a book that you didn’t even realize you were looking for. Bookstores, even the big box ones, also contribute to the larger community. For example, our local big box bookstore “adopts” an inner city elementary school every year. Monetary donations to a fund are solicited from the store’s customers. Donations are made to the school’s library, and sometimes, the children from that school get to come to the bookstore to choose a book. I have spoken to staff members who have been present at such visits, and their faces glow as they tell of the children’s excitement in being able to choose a book. To read more about Chapters/Indigo’s Adopt a School program, click this link. Thankfully, there are still some bookstores specifically geared toward children. I think it is so important to keep these alive, to show children that books are important, and that children’s books are important. A case in point is the bookshop that is depicted in the photos in this blogpost. 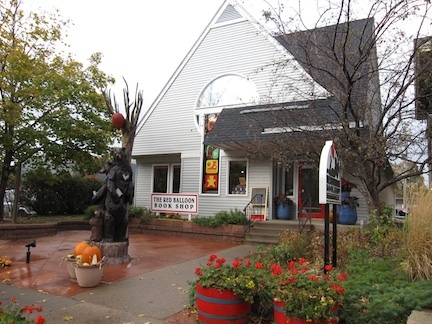 The Red Balloon Bookshop in Saint Paul, Minnesota is a vibrant, active place for children and books to be brought together. It regularly features signings, readings, and activities for all ages from infants to young adults. I only have photos of the exterior, because we visited on a Sunday when the store was closed. However, I’m already planning that next time I visit the cities, there will be a large window of time set aside for visiting The Red Balloon! Another children’s bookstore that is on my “bucket list” is Peter H. Reynolds’ bookshop in Dedham, Massachusetts, The Blue Bunny. Not surprisingly, given the fact that the store is run by a creative family that includes the author/illustrator of books such as The Dot and Ish, art supplies are available as well as books at The Blue Bunny, and there are regular creativity workshops. Other bookshops dedicated to children and children’s books are dotted around the United States and Canada (and no doubt other places in the world as well). Books of Wonder in New York; Monkeyshines in Calgary, Alberta, Canada; Woozles in Halifax, Nova Scotia, Canada; these are just a few — but there aren’t all that many of these delightful places left. I think it’s important for us to support them, champion them, and teach our children to value them. One way to do this is to participate in Take Your Child to a Bookstore Day, this year being held on December 1. Although that seems far in the future now, that time of year gets booked very rapidly, so why not put it on your calendar now? Your child will be grateful, now and in later years. Is there a children’s bookstore near you? Do you have memories of the joys of bookstores? Please share your stories in the comments. And DON’T FORGET THE GIVEAWAY! All August, commenters will be entered into a draw for a copy of Emma Walton Hamilton’s book Raising Bookworms: Getting Kids Reading for Pleasure and Empowerment. Disclaimer: I received no recompense for the mention of these bookstores on my blog. The citings are merely personal recommendations. I’m just glad to see there are some locations open to cater to children’s literature. I admit I love e-books, but there is still something wonderful about holding a book in your hand, the feel of it, the smell of it. Nothing like it. I haven’t gone the e-book reader route yet. I’m still a book in hand person. And I love browsing the shelves in bookstores! Sounds like a great idea, Erik! I was thinking of you and the Harleysville Bookstore when I was writing this post, and wondering what you’d do! I love that movie too. One of my most favorites. I work at one of the big chain bookstores and you’re right, it’s not the same as the special stores just for children’s books. I think when a child can walk into one of these, and see how many books are out there, just for them, they must have a sense of the importance of reading. Really good post, Beth. I shared it on my fb page for others to read. I think any bookstore is good for kids, but a kids’ bookstore is special! Thanks so much for sharing this post with your readers, Jackie! I am so lucky, here in my small community we have an excellent bookstore called Albany Books. It has a fabulous kids section. I have had my last two book launches there, which were very succesful. The owner believes in supporting local authors. In Vancouver we have Kid’s Books which is dedicated to children’s books in three locations. We also have a local chain called Black Bond Books with 7 locations in the Vancouver area. So we still have a number of local, small books stores to visit. West coasters really support independant book stores. That is SO good to hear, Darlene! If I ever get out to Vancouver again I’ll have to check out some of those bookstores!